Sheikh delivering as he promised. This shows that guy knows his work. Why is Ibrarul haq sitting there? he is a useless, talent less person. secondly, I am sure the ground work for this train was done in previous government, sh. rasheed just put his name on it for PR and come in IK's good books by running it to mianwali. Sh. RAsheed has been in politics and government for too long and knows very well about PR. Thirdly, big blunder by IK declaring he wont remove illegal kachi abaadi. This is how qabza group operate and with this announcement, they will setup kachi abadi on all government lands and after 5 years or gradually when the time is right they will start illegal constructions. We dont want to encourage this behavior. Such announcements must not be made. 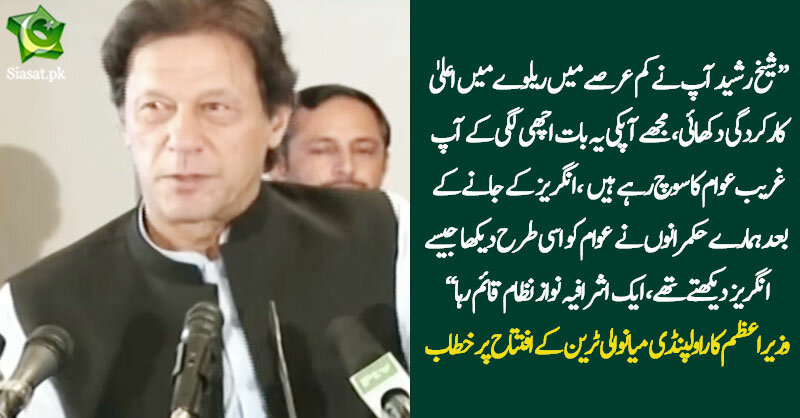 How silly of IK to say that. That was the first thing I thought too. Khan always spoke against PM doing such things. Totally unexpected. Agreed to the 2nd half shah jee.... it’s amazing too. its a gesture because the common man will get the benefit. No commission or kick backs included. Right, I was talking about him inaugurating it, not the project itself. Zabardast PM Imran Khan and Sheikh Sahib. Allah aap ko bohot lambi umar de aur hamysha khush rakhay . Ameen ! The real useless person us in Adiala jail,just an FYI. Well done PTI and sheikh saab. 5years of good work wipe out the corrupt elite IA.